Surviving cancer has a hidden side to be reckoned with. A cancer diagnosis requires some quick thinking on our part, once the dust has settled and we are able to accept a future that is suddenly quite different from the one we had planned on. One thing that most of us do as we move into the “survivor” phase of our recovery is consider the various methods of treatment available to us and their possible side effects. From the very beginning of my new and uncertain life, as I began to research my options with male breast cancer, I had trouble with the phrase “side effects” that accompanied virtually every form of treatment, whether chemotherapy, radiation or surgery. Dealing with the various forms of therapy are difficult enough for a new cancer patient, but add to that the ramifications of the treatment itself and you have the “double whammy” of cancer—the tipping point where we must weigh the benefits of our cancer therapy against the possible side effects. After my own diagnosis, I spent a good deal of time reading the patient reviews of various drugs that were recommended for me, along with the long list of potential negative consequences that were listed as “side effects.” First of all, losing one’s hair, nausea and vomiting, lymphedema, blood clots and depression are not what I would refer to as “side effects.” They definitely aren’t pushed off to anybody’s side, as far as I can tell. These symptoms are in the forefront for cancer survivors. They’re not a side show, or a side dish. They’re in the center ring. Center stage. Grand Central Station. They are the main event. 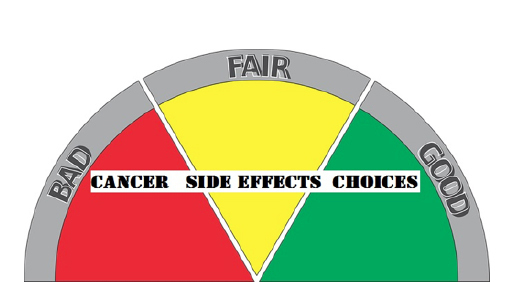 These so-called “side effects” are what many of us experience day-to-day while the numerous treatments and methods and experimental drugs are quietly doing their magic on our cancer cells. Somewhere in the background of our amazingly complex bodies, our own immune systems are busy trying to heal us. Silently. Diligently. And what we are actually feeling is a result of those compounds that have been infused into our bloodstream which the medical practitioners hope will aid us in some way. Let’s face it, cancer is a risky business. But new therapies are emerging constantly, and there is great hope for a number of them, in terms of the unpleasant results we sometime endure. But in the meantime, a thorough discussion with our doctors or better yet, with fellow survivors who have traveled the cancer path before us, can help us to make the best choices for our own health and healing. And why is it that the so-called “side effects” of drugs are listed last in the dosage instructions and in the tiniest print available? The obvious answer is that they really don’t want us to focus on them, but the truth is that nobody knows better about what our bodies accept or what they reject than us. We owe it to ourselves to read the fine print, ask questions and make choices based on our personal experience and the feedback we get from our own bodies. Rarely is a treatment for cancer completely free from unwanted side effects. So our job (as if surviving isn’t enough) is to weigh the benefits against the negative experiences, and make the choices that best serve us. Despite all the conflicting and confusing information swirling around us, we have the deciding vote in our own health. After all, when all is said and done, regardless of any side effects, it’s what’s on the inside that counts.